The Fokker D.I (company designation M.18) was a development of the D.II fighter. The D.I was also flown in Austro-Hungarian service as a reconnaissance aircraft under the designation B.III. Confusing the matter further, both the D.II and D.I arrived at the Front in German service at similar times, in July–August 1916. The main designer was Martin Kreutzer. Similar to the D.II, the D.I was an unstaggered single-bay equal-span biplane. The upper fuselage was parallel with the upper wing. Unlike the D.II, the D.I was fitted with the 75 kW (100 hp) Mercedes D.I six-cylinder water-cooled engine. Control was achieved using wing-warping. The wings were also tested in twin-bay form. To improve visibility, the center section was cut into and the wings were slightly staggered. These improvements were retained, and the airplane was ordered into production with an 89 kW (120 hp) Mercedes D.II inline engine and a single synchronized 7.92 mm (.312 in) LMG 08/15 machine gun. The Austro-Hungarian B.IIIs retained the D.I engine, and were armed with a Schwarzlose machine gun. Deliveries began in July 1916. 90 were delivered to the German Fliegertruppen, and 16 to the Austro-Hungarian Luftfahrttruppen (as the B III). Eight were license produced by the Magyar Általános Gépgyár in Hungary. This book came in a form-fitting self-sealing cello bag. It is hard-cover of 140 pages in 8 1/8” x 11 ¾” page format. WWI was the time of dynamic development of aviation. Aircraft created during that period and pilots who fought in them, became legends that have fascinated generations of pilots and aviation enthusiasts. Legends of Aviation in 3D is a publishing series with a goal to present legendary aircraft from the pioneer era of military aviation in an innovative way. Thanks to anaglyphs and color 3D renderings you can almost touch the Fokker Dr. I, see its details, get to know its meticulous airframe structure and understand the phenomenon of this legendary aircraft. With the virtual Fokker Dr. I, Marek Rys inspires us to explore the history of the aircraft afresh. The modern 3D images impressively harmonize with the old photographs Tomasz Kowalski tells us the story of pilots flying the Dreideckers and takes us to the dark and romantic period of the Great War when knights of the air were born and killed. 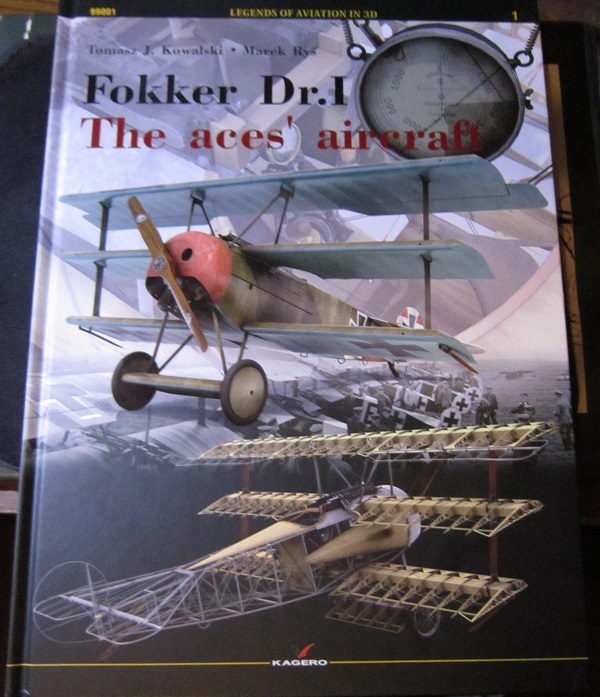 This publication is in English and is a valuable addition to literature concerning the legendary Fokker Dr. I and simultaneously a successful and exceptional attempt to present the earliest history of aviation in an original way. Kagero has made all efforts to make the layout and quality of the series fulfill the needs of readers,. This book comes with a cardboard pair of glasses that have one red lens and one blue lens, for viewing the illustrations in the book in 3-dementions (3D). Neat ! There are 50 black and white wartime photos in the book. These are followed by the bibliography, end notes, appendix 1 & 2 and 8 data charts. The color 3D illustrations amount to 70.I believe they are all computer generated. A side profile of Fokker Dr. I (425/17) belonging to Ritt. Manfred von Richthofen, the commander of JG. 1, Lechelle airfield, April 1918. A side profile of Lr. d. r. Willhelm Schwartx’s Fokker Dr. I (193.17) Jasta 12, Les Mesnil airfield, May 1918. A side profile of a Fokker Dr. I (number unknown) belonging to Oblt. Bruno Loerzer, the commander of JG III, Erchin airfield, April 1918. A side profile of Vzfw. Otto Esswein’s Fokker Dr, I (426/17), Jasta 26, Halluin-Ost airfield, April 1918. A side profile of a Fokker Dr. I (450/17) belonging to Lt. Josef Jacobs, commander of Jasta 7, Ste, Merguerite airfield, May 1917. A side profile of Lt. Lothar von Richthofens Fokker Dr. I (454/17), Jasta 11, Jafu airfield, March 1917. Left and right ¾ views of a Dr. I (503/17) from Jasta 11. Front and rear ¾ views of a Dr. I (502/17) from Jasta 11. 59 illustrations showing the internal ribbing of the Fokker Dr. I. 3 illustrations of the Fokker Dr. I’s cowling. 37 illustrations of it’s machine guns, showing all parts of their anatomy and some illustrations of them hooked up to the ammo box. 6 illustrations of the cockpit interior. 4 illustrations of the main landing gear. 28 illustrations of the motor and it’s parts. 4 illustrations of the fuel tank and its guage. 4 illustrations of an external speedometer that was mounted on some aircrafts. 3 illustrations of the control stick. 7 illustrations of the two-bladed propeller. Eight ¾ views of a Dr. I (450/17), belonging to Josef Jacubs, commanding officer of Jasta 7, fitted with a captured French engine and a British propeller. Four ¾ views of Manfred von Richtofen’s Fokker Dr. I. 3 illustrations of Werner Voss’s Fokker Dr. I. 4 illustrations of upper wing and tail paint patterns. Wow ! If a modeler is going to build a model of the Dr I triplane this is definitely the book to have. Highly recommended. It will be of much interest to both modelers and aviation enthusiasts for sure. I want to thank the folks at casemate and Kagero for this sample. There is a page in the book that shows the color cover arts of other books that Kagero publishes about WWI aircraft. These can be seen on Casemate’s web site, who are the distributor of Kagero books.